A peace conference in the Democratic Republic of Congo is on hold until Wednesday as organizers try to cope with a large number of delegates. The conference is to bring together delegates from the government and from rebel militias that have been battling in eastern DRC since last year. Selah Hennessy reports for VOA from Goma that organizers say they are still optimistic about the outcome of the conference. More than 1,000 delegates from across Congo have poured into this eastern capital, Goma, during the past few days. Conference organizer Vital Kamerhe, the leader of Congo's National Assembly, says twice as many people have come for the conference than were expected and Monday's delegate registration was extended into a second day. He says organizers are trying to cut the numbers down so the conference can go ahead on Wednesday. Meanwhile, the city is jammed with soldiers, policeman, and various militias who have fought each other in bloody battles during recent months. On Sunday 10 delegates loyal to renegade General Laurent Nkunda arrived in Goma, escorted by a U.N. Guard. Since last August Nkunda's men have been battling the national army in the hills and thick jungle of eastern Congo. In early December the government launched an all-out offensive against Nkunda's rebel militia, attacking his positions with a 20,000-member army. But the army was unable to defeat Nkunda's highly-trained and experienced insurgents, and by the end of the month army troops were fleeing key strategic positions. The government then called for a conference to bring peace to the war-torn region. But it is struggling to get off the ground. It was initially set to take place at the end of December, but disorganization delayed its start. The conference was formally opened at a ceremony on Sunday, but President Joseph Kabila and Nkunda were both absent. Organizer Kamerhe says he is optimistic that the conference will begin Wednesday and will run smoothly. "I am very optimistic because all the peoples of North and South Kivu decided to build peace," said Kamerhe. Rebel leader Nkunda says he has been fighting to protect local ethnic Tutsis from a Rwandan ethnic Hutu militia, the Democratic Front for the Liberation of Rwanda or FDLR. Nkunda accuses the army of failing to protect the Tutsi population and of fighting alongside the FDLR. Kamerhe says the FDLR will not be attending this conference because, he says, this is a conference only for Congolese. "That is the armed group of Rwanda, it is not Congolese," he said. 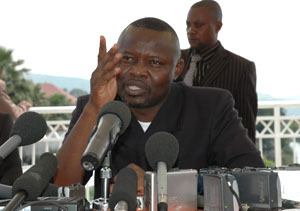 Kamerhe says the peace conference is to end next Monday.